December 29, 1980: Huffman, TX. About 9:00 P.M. The incident is described very well by Richard Hall in Vol. II, The UFO Evidence. While driving through the Piney Woods of East Texas, about 40 miles northeast of Houston, Betty Cash and her two passengers noticed a bright light ahead. As they drew within about 130 feet (40 meters), they were confronted by a fiery diamond-shaped object, emitting flames down toward the road. What happened after that is mind-boggling. Please read the reports below. Betty Cash and Vicki & Colby Landrum suffered apparent radiation illness after watching flame-spewing UFO and mystery helicopters. Several aspects of this incident never quite struck me right. Although there is no doubt that the incident occurred, it is considered by some to be a non-UFO case. 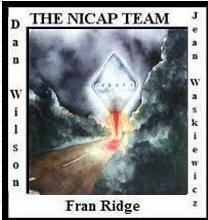 The case is double-listed on the NICAP UFO dBase as a Cat. 6 or Physical Trace Case (TRACAT).